Even though he didn't have an ounce of wrestling experience, Nikita decided to give the profession a stab, thinking that if it didn't work out he still had a tryout with the Bandits. So Nikita called Crockett and told him he was interested in slamming bodies as a wrestler. True to form, Nikita also told Crockett he had never been in a ring. Sight unseen, Crocket's only instructions were for Nikita to be in his office with his head shaved bald. When the time came Nikita traveled to Charlotte and opened the door to Crockett's office. Looking at Nikita's skimpy waist (34 inches) and colossal muscles Crockett was shocked at his size. His eyeballs bugged out even more when he instructed Nikita to take off his size 54 sport jacket and removed his shirt. Each muscle was ripped to near perfection. Crockett immediately fetched Ivan Koloff, and Don Kernodle. Both men were among Crockett's top-of-the-line wrestlers. Ivan played the role of a mean wrestler from the Soviet Union while Kernodle's character was that of an American defector who sided with the Russians. The two men formed the championship team in the wrestling enterprise. As soon as Ivan and Kernodle saw Nikita they knew they found the "nephew". Kissing a chance at playing football good-bye, Nikita signed up as a wrestler with the NWA. He was told that he would play the character of a Soviet wrestler, looking mean and wearing a chain. He was immediately put on the set for interviews, instructed to stand silent with folded arms and a scowling face, behind Kernodle and Ivan. He played his part well. Afterwards, he was told he would be wrestling the next night in Raleigh, N.C., before a huge audience, and taping a special four hour television event with the who's who of wrestling. Arriving late, Crockett made the decision not to let Nikita wrestle. Ivan convinced Crockett to give Nikita a chance. In his first match Nikita defeated his opponent in 10 seconds - a record time. Because of his association with Ivan and Don, Nikita gained an immediate disliking from the fans. From that night on, Nikita's career was launched. For the next two months experienced on the job training - sometimes battling two or three opponents at one time throughout the Mid-Atlantic. His rise to stardom came quickly. Playing the part of a Russian during the cold war was about as evil as it got. It was a role that Nikita took serious, extremely serious. Fans booed him like no other wrestler and death threats against him were common because fans believed he was a threat to America. Nikita developed the character as a Soviet wrestler who was suppose to compete in the 1984 summer Olympics Games in Los Angeles which was boycotted by the Soviets. The character was suppose to be a superstar athlete who was gunning to win medals in track, field and wrestling. A unique feature to Nikita's character was that he spoke no English - he even studied the Russian language and learned to speak and write Russian..
Nikita also came close to landing a movie role in Rocky IV with Sylvestor Stallone. In the movie Stallone's boxing character was training to fight the no good Russian boxer, Ivan Drago. A casting call went out for someone to play the bad Russian and Nikita was on that short list - one of three finalists. He was flown out to Los Angeles and performed in a screen test with Stallone. Another character, a smooth looking blond, won the part. During 1986 Nikita reached the top for those playing the bad guy. He was voted by fans as the No.1 most-hated wrestler. While on tour in Japan, Nikita's nemesis, Magnum T.A. was paralyzed in a car wreck in Charlotte, NC. Being groomed to one day replace Ric Fair, the promotion was devastated by the accident, and now wondered who could replace such a void. Upon Nikita's return from Japan, he was informed of Magnum's accident. Crockett had an idea: typical to the wrestling business, when a wrestler gets to be that good, or bad depending on your point of view, it's time for a switch to the other side - and they promoters suggested to Nikita that it was time for him to wear the white hat. Before his accident, Magnum's tag team partner was wrestling legend "The American Dream" Dusty Rhodes. Magnum's accident now left Dusty without a partner in his feud against the "Four Horsemen". After thinking over Crockett's suggestion, Nikita decided to accept the new challenge. So Nikita changed from the ugly Russian who hated Americans to one who fell in love with the country and became as loveable as hot dogs and apple pie. 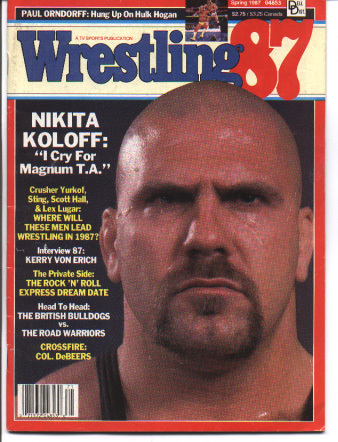 A top wrestling magazine ran a cover photo of Nikita's face with a tear trailing down his cheeks. The caption said he was crying for his friend Magnum TA. That sealed his new image.